The "bridle path" on a horse is the trimmed area of mane just behind the ears where the bridle or halter rests. Trimming a bridle path helps to keep the halter or bridle from tangling in the mane hairs. A bridle path is commonly trimmed on all kinds of horses of all riding disciplines. Trimming a bridle path neatly helps to keep any horse looking its best. 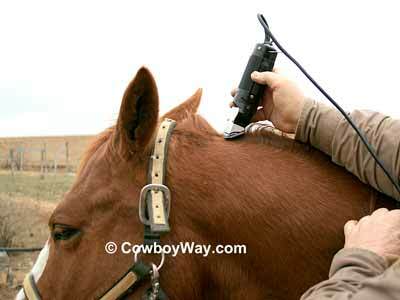 In the photos and text below we'll give you some tips on how to trim your horse's bridle path. 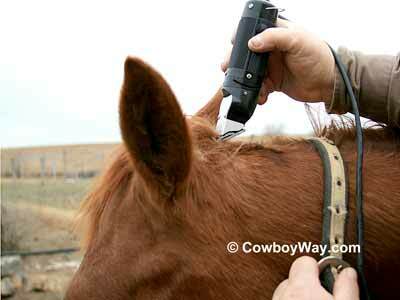 Please keep in mind this article assumes your horse accepts being trimmed with electric clippers. Begin by deciding how long you want your horse's bridle path to be. The first step in this decision is to decide where the bridle path should begin, then decide where it should end. To decide where the bridle path should begin, most riders of English and Western disciplines agree that the bridle path should begin about 1 fingers' width behind the ears. Where the bridle path should end, however, often varies between English and Western riding disciplines. In Western riding there is an old rule of thumb still in use today that says the bridle path should be as long as the horse's ear is tall. To measure this, gently lay the horse's ear backward along its neck. See the photo below. Below: This horse is ridden in Western tack only. 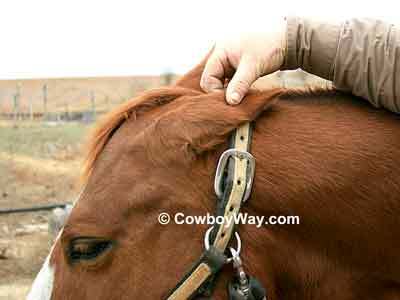 His ear is being laid along his neck as a measurement of how long his bridle path should be. In English riding circles, and with some Western riders, bridle paths are shorter, often just long enough to accommodate the width of the bridle. You can begin trimming at the front of the bridle path or the back; it's your choice. Usually, you will get a slightly closer cut by trimming against the growth of the hair. For a bridle path, this means trimming from front (where the ears are) to back. However, to trim the bridle path shown in the photos on this page the horse was trimmed from back to front. This is because there were some mane hairs blowing around in the wind and starting at the back made it easier to keep the mane hairs out of the way. At first the halter was pushed forward, close to the horse's ears. As the back of the bridle path was trimmed the halter was pushed down the horse's neck to allow the clippers room to trim closer to the ears. See the next photo. Most people will want the front of the bridle path to begin about 1 fingers' width behind the ears, so this is where the trim was stopped. This should allow enough room for the bridle or halter without cutting into the forelock hairs. When trimming your horse's bridle path you will be standing very close to the horse's head. This can be dangerous if the horse should suddenly move its head or front legs. Use appropriate precautions and have a friend help you if necessary. If it's fly season you will also want to apply fly spray to your horse to encourage him or her to stand still.